$390.00 Badge of an Activist of MOPR (Society to Help Revolutionaries), #4561, 1928-1941. 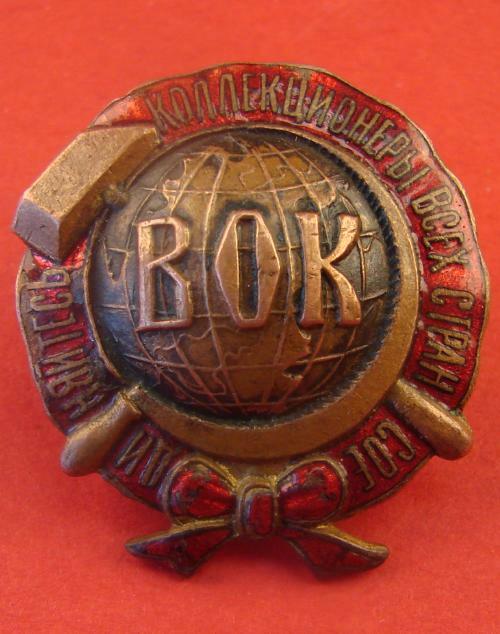 $190.00 MOPR (International Organization to Help Revolutionary Fighters) Badge for Donations, 1932. Scarce variation with blue background. In very fine to excellent condition. To see other early Soviet sports badges, please follow this link: "Soviet Sports Awards"
$380.00 "Down With Illiteracy" Society, membership badge, 1927 issue. A very uncommon early badge in characteristic Constructivist style. In very fine to excellent condition; includes original screw plate. $390.00 ODD (Friend of Children Society), membership badge, 1924 - 1935. Screw back version in outstanding condition. $550.00 Membership Badge of the Detkomissiya (Children Agency) at the Central Executive Committee of the USSR, early to mid 1920s. $220.00 Union of Militant Atheists badge, 1925-1947. Presumably the youth version of the membership badge. Pin back variation in very fine to excellent condition. $170.00 All-Union Society of the Friends of Museums of the Revolution, membership badge, mid to late 1930s. In excellent condition, with perfectly preserved enamel.